Today we went to Birra’s pizza and got cheeseburger pizza. A cheeseburger pizza is a pizza with cheeseburger toppings. The pizza’s crust is gooey and great. The ground beef is well done (I like it that way). They use bread and butter pickles not dell pickles. The cheese is provolone, it is melted and stringy. The pizza has big tomatoes, they look and taste like they’re from a can. It smells a bit like a burger. The lettuce is crunchy like normal. All together the pizza tastes like a burger, is really filling and is excellent! 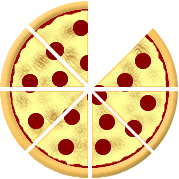 I give Birra’s pizza three and one half slices out of four! I give this place 3.5 slices.